There are some important ways in which the work of Friends of North Beach Park has been recognized. 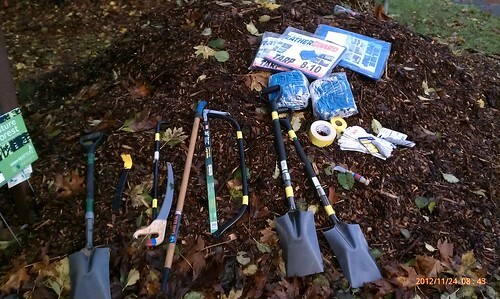 In 2012, we received a Groundswell NW microgrant of $500 that we used for the purchase of tools and some outreach supplies. Some of the tools we purchased. In 2014, Groundswell NW again recognized Friends of North Beach Park by awarding Luke its “Local Hero” award. This award is shared among all the people who have worked to restore North Beach Park, particularly the other forest stewards who are there week in and week out, or who come to every work party. And, although details still need to be ironed out, Friends of North Beach Park was just awarded a Washington Native Plant Society Stewardship Grant. This grant is another recognition of the growing success of our work in restoring North Beach Park, and will add to that success. We will use it to purchase a suite of wetland plants to plant into the bottoms of the park. Our native wetland plants have much deeper and more complicated root systems than the invasive ivy and blackberry they’re replacing. There is, of course, still years of work to be done. You can help us with this work by donating to Friends of North Beach Park, tomorrow, May 6th, any time between midnight and midnight. Donating during GiveBIG is a great way to support our restoration efforts. Your tax-deductible donation will be matched by the Seattle Foundation, and all moneys received will be used for the restoration of North Beach Park. We’re entirely volunteer run, with no paid staff or office costs, so even $25 will have a large impact.